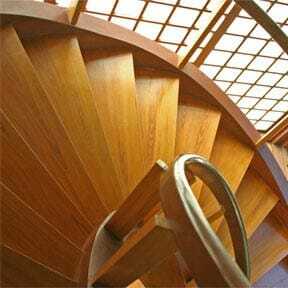 Staircases are fundamental to any house that has more than one story. They come in all heights, widths, and configurations, from basic and utilitarian to grand and sweeping. The form a staircase takes is determined by the home’s design, the builder’s skill, the amount of space available, and the budget. A staircase that runs straight from one floor to the next is easiest to build but can be somewhat formidable to climb. Stairs that stop at a landing and turn 90 or 180 degrees take up less space and can be safer and easier to traverse. 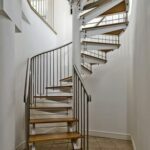 A spiral staircase takes up the least amount of space and is economical to install, but it is not easy to climb, is particularly impractical when you need to carry large objects from one floor to the next, and is not safe for use by children or the elderly. In this section of HomeTips, you will find information on the various types of staircases, how they are built, and how to maintain them.